Sunderland midfielder Arnau Riera has signed a season-long loan deal to return to Falkirk despite picking up an injury during a pre-season friendly. The 26-year-old was substituted during the Bairns' 0-0 draw with Hartlepool. But head coach John Hughes told BBC Sport: "It was only a knock. Everything has been completed." Meanwhile, Hughes dismissed as "pure speculation" suggestions that Chelsea and Manchester United have expressed an interest in midfielder Scott Arfield. Arfield has come through the youth ranks with Falkirk and the 19-year-old has already made 39 first-team appearances. "Scott Arfield has to keep his feet on the ground and will still be here in three years time," said Hughes, who appears determined to keep hold of his protege until the end of his contract. Meanwhile, the head coach is delighted that Riera - the Spaniard made 22 appearances last season - has returned to Falkirk Stadium. 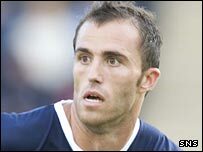 Reira, who is expected to be out injured for up to a week, played only twice for Sunderland since arriving from Barcelona in 2006 and spent time on loan with Southend United before being farmed out to Falkirk. "He picked up a couple of injuries last season that hampered him, but he is a quality player, a real good footballer," said Hughes. Hughes is still looking to strengthen his squad further and Falkirk are believed to be vying with Hibernian and Kilmarnock for the signature of former Aberdeen striker Steve Lovell.